HOUSTON, TX, July 3, 2007 – Two faculty members from the C. T. Bauer College of Business – Professor Everette Gardner and Assistant Professor Leiser Silva – have received professional recognition for their work in the field of Decision and Information Sciences (DISC). Professor Everette Gardner, who has a Ph.D. in Operations Management and is a Vietnam veteran with 20 years in the Navy, has just been named a Fellow of the International Institute of Forecasters. Professor Gardner’s 1985 article, “Exponential Smoothing: The State of the Art,” recently was ranked as the third most influential article in forecasting published during the last 25 years. The two authors ranked above Professor Gardner on the list are the winners of the 2003 Nobel Prize in economics, Robert Engle and Clive Granger. Professor Gardner has received numerous teaching awards from the University of Houston and is a world-recognized author and consultant on forecasting and operations management. 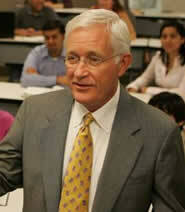 Professor Gardner also made three presentations on forecasting in June throughout North America. In Montreal, he spoke to the Ernst & Young Airline Auditors Conference on forecasting the usage of frequent flyer miles. he spoke at a Houston meeting of the American Production and Inventory Control Society’s top management night on forecasting for operations management. In New York, he spoke to the International Symposium on Forecasting on trend extrapolation. Assistant Professor Leiser Silva, who has a Ph.D. in Information Systems, has been appointed as a visiting research fellow at the London School of Economics. He recently gave two seminars there: (1) “Fighting against windmills: the implementation of strategic information systems and deep structures“; and (2) “A tale of an academic journey: from the LSE to business schools in North America.” Assistant Professor Silva also traveled to Cambridge University to give a seminar highlighting a recent MIS Quarterly article. His areas of research expertise include power and politics in the adoption and implementation of information systems, with an emphasis on public organizations. For more information on the accomplishments of Professor Gardner and Assistant Professor Silva and the work of the Bauer’s Decision and Information Sciences Department.